If you scratch the surface of the Huron Fringe Birding Festival (HFBF) you will invariably find members of the Bruce Birding Club (BBC) peeping through. The simple reason being that both organizations have been happily, productively and inextricably linked for a number of years. 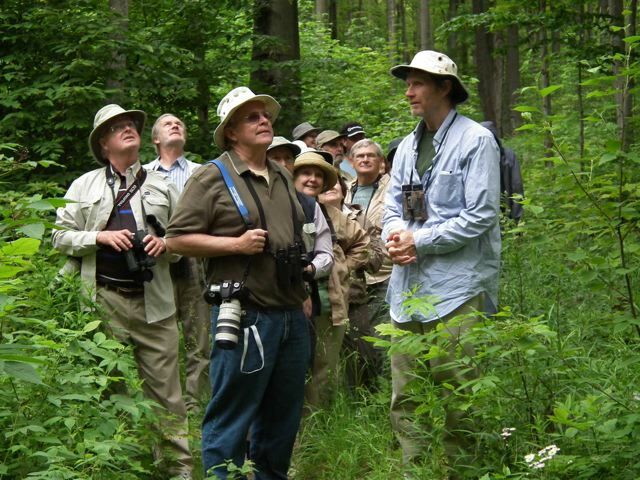 The Bruce Birding Club, which started in the fall of 2002, is a gathering of friends who share a common interest – the love of birds and nature. A former birding club in the area called the Bruce County Bird Finders Club (BCBFC) was the foundation of the BBC’s origin as a local birding club. The BCBFC had not operated for 9 months. Fred Jazvac, the only remaining active member of the BCBFC, restarted the concept by recruiting new people from the local Huron Fringe Birding Festival. And it grew from there. Outings were held on Wednesday to avoid the days when the local curling club was operating. 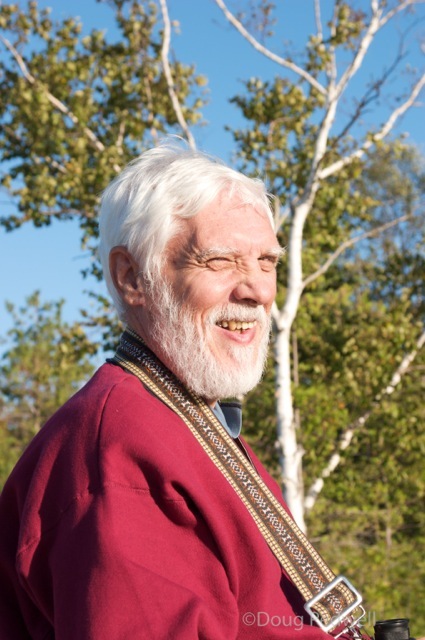 That change brought in Mike Pickup, a local, experienced birder and great contributor to the Friends of MacGregor Point Provincial Park. MIke the recruiter brought in Margaret Anderton and Tania Gilchrist. As news of the BBC spread out of town birders began to show up. Dave Schaus from Walkerton, John Cummings from Clifford, Ralph and Mary Anne Knowels from Kincardine who brought in James Turland, Jim and Judy Duncan and Mike and Helen Penfold from Owen Sound. These new additions also brought a level of expertise and leadership that enhanced and improved the club. With these beginnings birders were attracted from a much wider area than Saugeen Shores They came from Collingwood, Thornbury and Kitchener and participated on a regular basis. From time to time visitors from farther away places in Ontario and even England have dropped in. Some of the earliest members were the late Wendy Grava and Cynthia Isber. In 2002, Wendy Grava took it upon herself to keep a list of the sightings of club outings emailing them to members. Wendy designed an excellent template to report on the outings. It is still used today by the BBC with some modifications. Our love of nature is evident in contributions made beyond the BBC. Club members have volunteered heavily in bird related activities in our area. BBC members make up 11 of the 12 members who run the Huron Fringe Birding Festival. They have been active today and in the past in compiling at least 4 different local Christmas Bird Counts. Our members also participate in five CBC’s locally. They have been heavily involved in the Breeding Bird Atlas, grassland and owl surveys, and in the Piping Plover project at Sauble Beach. BBC member, Stew Nutt ran that project in its most successful years. One of our members, Judith King was honored by Bird Studies Canada for her participation in point counts across Canada. Our members have led bird hikes for the HFBF, the BBC, local naturalist clubs and OFO hikes. What is especially good about that is some of them were beginning birders who learned their skills by being members of the BBC. Because of this shared learning hike leaders for our outings come from volunteers from the club membership. While we do not actively recruit members for the BBC, we never turn away people who are interested in joining us. At times we wonder if we have too many for an outing, so we tend to break up in small groups when birding and there is plenty of expertise there to manage the sightings. We pride ourselves in being different than other leader-led hikes because everyone participates in finding and identifying birds. In some sense, the BBC is unique in that it has no President, no fees and no formal organization. It is held together by the friendliness of its members who come from all walks of life, through excellent communications, through sharing of photographs, sightings at their homes and rare and interesting birds that they see in the field. Bonnie Patterson-Collins, artist, hike leader, volunteer, early member of the BBC and photographer started the sharing of photographs. Because of this closeness between club members, one wonders if the BBC is a birding club or a social club. What matters is having fun, enjoying nature and our time together. Best of all we are always learning from each other. Life is good. Birding is an all-season activity. The BBC at Niagara. A short while back, local birding legend and author Mike Pickup had a vision. In his mind’s eye he imagined a structure that allowed people to be safely hidden while viewing birds in their natural setting. He was talking about building a Bird Blind to provide birders, naturalists, artist, photographers and the general public an up close view of the wetland species that inhabit and migrate through MacGregor Point Provincial Park. That vision is now a reality as the Friends of MacGregor Point Park, with a great deal of labour and engineering from the Park staff and strong financial support from the Huron Fringe Birding Festival (HFBF), the local community and sponsors, completed the Bird Blind Project in the fall of 2011. Come spring if you take part in a HFBF hike along the Tower Trail to the Ducks Unlimited Pond you will be able to experience an unimpeded view of songbirds and water fowl out through the viewing slits onto the D.U. Pond from the hidden comfort of the blind located off the same sideroad as the tower but on the eastern side of the pond. The Blind can be accessed by a short trail and lead-up ramp from the Tower Trail on the southern edge of the Park. 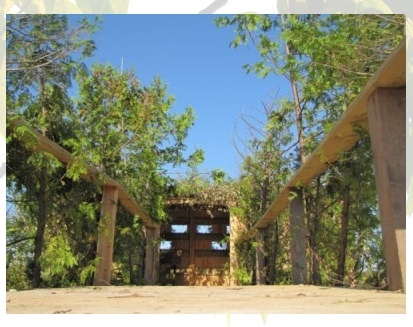 The Bird Blind – From Friends of MacGregor Point Park website. Thanks go to the Friends Board of Directors for again demonstrating a leadership role in moving forward a project that enables every visitor yet another unique opportunity to enjoy and experience the natural jewel that is MacGregor Point Provincial Park. The Friends of MacGregor Point Park reason for being is to assist the park with endeavours that fall outside normal park operations. Before the Bird Blind an observation tower was constructed to help highlight the role of the Huron Fringe as a migration corridor and important natural area for nesting birds along the Lake Huron shoreline. Interpretive panels along the Huron Fringe, Lake Ridge and Tower trails; the construction of the Rotary Trail to link Port Elgin with the Park and the placement of information panels in the Park’s comfort stations are just some of their physical improvements to the Park. Established in 1993 as a registered charity, the Friends of MacGregor Point Park are a group who are passionate about MacGregor Point Provincial Park. Led by a volunteer Board of Directors, they work cooperatively to support and enhance interpretive, educational and research projects and programs within the Park. A legal agreement between the Friends and the Crown; provides formal parametres for this relationship and provides definition for the extent to which they become involved in Park Operations. Program enhancements have varied from the annual support of student positions and guest speakers to larger festivals such as Sparkle in the Park (formerly Snowfest), Wild for the Arts and of course, the Huron Fringe Birding Festival. All of these festivals bring varied interest groups into the Park and the Saugeen Shores area. The volunteer Board of Directors of the Friends is a working board committed to finding ways to raise monies in order to honour their mandate of enhancing the interpretive, educational and research aspects of the park. Revenue from the Friends Huron Fringe Shop, located in the Visitor Centre, and other fund raising ventures stay in the Park. So Mike’s vision is now a reality. And when you take part in the Huron Fringe Birding Festival next spring, be sure to pay it a visit. The birds will be waiting.